It’s arguable that Juniper Networks has been the most successful competitor to Cisco over the past 20 years, and co-founder and CTO Pradeep Sindhu’s vision is the main reason why. 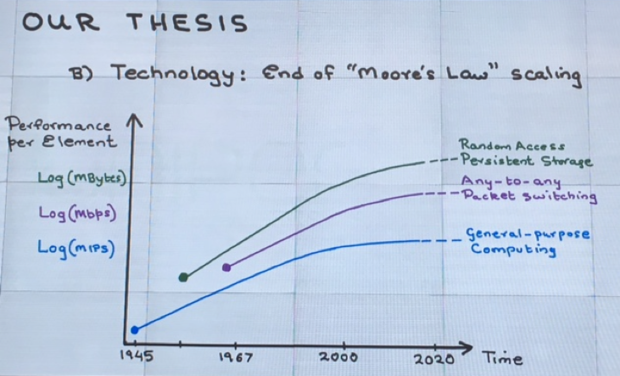 Included in that vision is Pradeep’s Principle, which is based on the thesis that we are seeing the end of Moore’s Law. If you’re not familiar with that law, in 1965 Intel co-founder Gordon Moore surmised that the number of transistors per square inch on an integrated circuit would double every year, effectively giving us twice the processing capacity in the same time frame. Sindhu isn’t the only person to say Moore’s Law is coming to an end. Earlier this year, a post on ARS Technica UK made a similar observation. Sindhu extended this thesis to storage and packet switching and stated that the rate of growth for all of these elements has slowed down. The death of Moore’s Law has been predicted for years, but Intel and the other chip manufacturers have been able to maintain geometric scaling with new innovations. At 90nm, strained silicon was used to speed up processing, and at 22nm, tri-gate transistors were introduced. However, there will come a day where transistor density physically cannot become more dense. It might come at 4nm or 2nm, or perhaps 3D scaling might ward that off, but the day will come. I’ve seen theories that chip manufacturing will move away from silicon to some other material, such as indium antimonide or even carbon, both of which would enable faster clock speeds and create another generation of Moore’s Law-like growth. If you’re a network architect, do not despair. In addition to bringing this problem light, Sindhu—speaking at Juniper Network’s Customer Forum, NXTWORK 2016—offered a solution. The first step in squeezing more performance out of Moore’s Law is to pool resources and scale out the environment, similar to what the cloud giants do today as they build their own massively scalable data centers (MSDC). These companies have had to adopt this model to continuously one up each other. With this type of architecture, the network becomes the bottleneck as it takes on the role of the “backplane” of the MSDC. If the network isn’t fast enough, there will be a lag in processing capabilities. The next step will be to use the network to interconnect multiple data centers with low latency connections. In this case, think of the cloud as a collection of pooled resources, like processing and storage, over geographic distance and being inter-connected with a high-performance network. In this scenario, its unlikely that network managers can continuously update the network fast and efficient enough to meet the needs of an environment that must scale over distance. This brings up step two of Pradeep’s Principle: network automation. This doesn’t mean simple automation like the provisioning of QoS or VLANs. 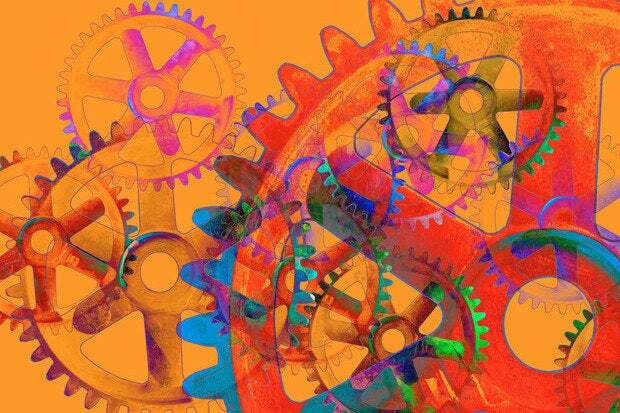 Sindhu made it clear he was talking about a network that was almost autonomic and self learning in nature and could quickly adapt to any kind of environmental changes. If one looks at the elements above, Sindhu is clearly talking about software-defined networking (SDN). And he feels Juniper currently has a full suite of products to address these needs. For example, OpenContrail is a highly scalable, standards-based controller. Its NorthStar product provides multivendor, path optimization for WANs. Another example is the hierarchical telemetry and analytics provided by Open Collector. Personally, I don’t fully agree with Sindhu’s thesis that Moore’s Law has run its course. The chip manufacturers have always and will likely figure something out to continue to exponential growth. I’ll agree that the way chips are currently built may have some limitations, but that’s why the industry has huge companies working on this problem. However, I do believe the benefits that Pradeep’s Principle brings are valuable, and businesses should embrace automation whether or not Moore’s Law holds true.